Olive oil is more than just a healthy food: it's an effective beauty product, too. Women in the Mediterranean region have used it for millennia as a moisturizer, cleanser and general tonic. To use olive oil on your own skin, you don't need fancy products; you can make your own simple treatments at home using extra virgin olive oil and other basic ingredients. Olive oil softens and moisturizes your skin naturally, making it an effective cleanser for dry skin. If you want to scrub and remove dead skin cells to brighten your facial tone, tighten pores and lift wrinkles, add a gently abrasive element, such as sugar or salt. For a cleansing scrub, mix 1/2 cup of olive oil with 1 tbsp. of sea salt. Use all over the body, including your face. For a moisturizing scrub, mix 1/4 cup of granulated sugar with 1 tbsp. of either grated cucumber, aloe vera juice or mashed avocado. Drizzle in enough olive oil to make a smooth paste, then scrub gently into your face and rinse off. Carol Firenze of thepassionateolive.com recommends a moisturizing, skin-firming facial mask made from honey, egg and extra virgin olive oil. Mix 1 tsp. of oil with 1 tsp. of honey and a single egg yolk. Stir until smooth, then apply gently to your face and neck. Let sit for 15 minutes. Rinse in lukewarm water, and gently pat your face dry. Some oil will remain to moisturize your skin. You can apply extra virgin olive oil directly to your skin as a moisturizer. Olive oil's chemical distribution is similar to the skin's own natural oil, or sebum; it softens and smoothes your skin, leaving it supple while locking in moisture. In addition, olive oil is high in antioxidants and can stimulate the production of collagen and elastin. For an olive oil emulsion, mix equal parts oil and water with a hand-held frother, or apply oil to skin while still moist. Make your own night cream to leave your skin glowing and lighten discolorations. Mix 1/2 cup of olive oil with 1/4 cup of vinegar and 1/4 cup of water. Splash water on your face, then smooth the mixture over your skin. Apply before bed, and leave on all night. The water will rehydrate your skin, while the olive oil softens and moisturizes; vinegar lightens discolorations, loosens skin tags and kills bacteria. Olive oil is considered by some to be an effective anti-aging tonic when taken internally. 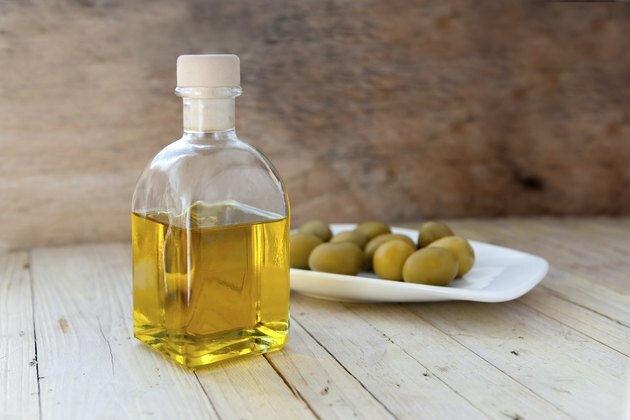 By swallowing olive oil, some claim, you can actually improve your skin and reduce the effects of aging. Olive oil's effectiveness may be based on its high percentage of polyphenols and vitamin E. Sophia Loren is the best-known spokesperson for the olive oil elixir; according to Carol Firenze at thepassionateolive.com, Ms. Loren swallows 2 tbsp. of extra virgin olive oil daily and names olive oil as one of her personal beauty secrets. Pioneer Thinking: Olive Oil in Your Beauty Routine?